February 22, 1979, City of San Antonio designates Avenida Guadalupe as a Neighborhood Business Revitalization Target Area. Motion was made by San Antonio City Councilwoman Mrs. Hellen Dutmer and seconded my Councilman Joe Webb. Motion carried unanimously. December 6, 1979, Edmundo E. Rodriguez (1321 El Paso Street), Eugenio Macias (1982 Donaldson), and Daniel Saucedo (1214 Colima Street) incorporated Avenida Guadalupe Association under the Texas Non-Profit Corporation Act, perpetually, to operate exclusively for the promotion of social welfare, common good and general welfare of the residents and merchants in the Avenida Guadalupe Project Area, then a severely neglected Mexican-American community. Partners in this unique and now iconic strategy for urban renewal included the City of San Antonio, the San Antonio Development Agency (SADA), Frost Bank, and H.E.B. Of special note, Edmundo E. Rodriguez is credited with founding COPS (Citizens Organized for Public Service) from his parish – Our Lady of Guadalupe Church, whose street address is the initial registered corporate office of Avenida. In 1979 Daniel Saucedo was the long-time Executive Director of the Inman Christian Center, established at 1214 Colima Street in 1913 as the Mexican Institute, an outgrowth of Central Christian Church, for the purpose of aiding some of the roughly 60,000 Mexican immigrants in the San Antonio area fleeing the Mexican Revolution, providing them basic social services and teaching them English. Eugenio Macias, in a July 26, 1980 article by Mike Greenberg in Perspective (San Antonio Light) is quoted, “I will be very glad to take a sledge hammer to that building… That’s where I was born”, speaking frankly about the dirt floor corral house where he lived until he joined the United States Military. Greenberg wrote, “The corral house where Macias was born symbolizes what is worst about this neighborhood – the poverty, the high unemployment rate, the dilapidated residential and business structures, the vacant storefronts, the dearth and viable businesses – except for the cantinas, which are here in abundance. Greenberg further wrote, “Despite its manifold problems, the Guadalupe Street area is a neighborhood with remarkable strength – the loyalty of some of its long-term residents”. 1980, AGA completes, “Commercial Survey of Guadalupe Street Area”, in conjunction with the Division of Environmental Studies at the University of Texas at San Antonio. 1980, AGA completes, “Avenida Guadalupe Neighborhood Improvement Plan”, in conjunction with the Division of Environmental Studies at the University of Texas at San Antonio. Section 1.1 of the report states, “the Avenida Guadalupe Neighborhood suffers from a variety of social, physical, and economic problems: Seventy-five percent of those employed earn less that $12,000 yearly; unemployment in one part of the area is twice the national average; and residents’ educational achievements lie below the national average.” Section 3.4 lists community organizations serving the area as: The Inman Christian Center, Headstart, Project Stay, Guadalupe Community Center, Mexican American Neighborhood Civic Organization, and Mexican American Unity Council. 1980, Implementation of a 3.5 block Urban Renew Project demolishing much substandard housing while relocating an equal amount. 1981, El Diez y Seis de Septiembre Parade (Annual) is established as San Antonio’s largest citywide cultural parade, observing Mexico’s Declaration of Independence from Spain on September 16, 1810. Particular tribute is paid in remembrance of Juan Bautista de las Casas, who gave his life leading the Texas strategy of Father Miguel Hidalgo’s revolt against the Spanish crown from Presidio San Antonio de Bexar. 1981, Facilitation of restoration of the facade of Lady of Guadalupe Church-Shrine at 1321 El Paso Street. The church then was 72-years-old. The formation of Avenida Guadalupe Association in large part includes participation from Guadalupe Church leadership, particularly that of Father Edmundo Rodriguez – Founding Treasurer of AGA. 1982, Facilitation for lease of improvements of Historic Teatro Guadalupe at a cost of $165,000 leading to theater land purchase for Teatro Guadalupe sub-lease to the Performing Arts Nucleus, Inc. (PAN). Ultimately, Teatro owner William Schlansker raised $1 million for the theater’s restoration and completion as planned by Reyna-Caragonne Architects and implemented by Avenida Guadalupe Association. San Antonio City Councilman Bernardo Eureste led the City charge to purchase the land where the theater is located. March 8, 1984, San Antonio City Council approved an agreement with the Performing Artist Nucleus for its first ten-year sublease of the Teatro Guadalupe, then a contentious consideration having municipal investment in Hispanic arts organizations unprecedented nationally. San Antonio City Councilman Frank Wing (DECD.) championed this first agreement for long-term municipal support of Latino cultural arts. 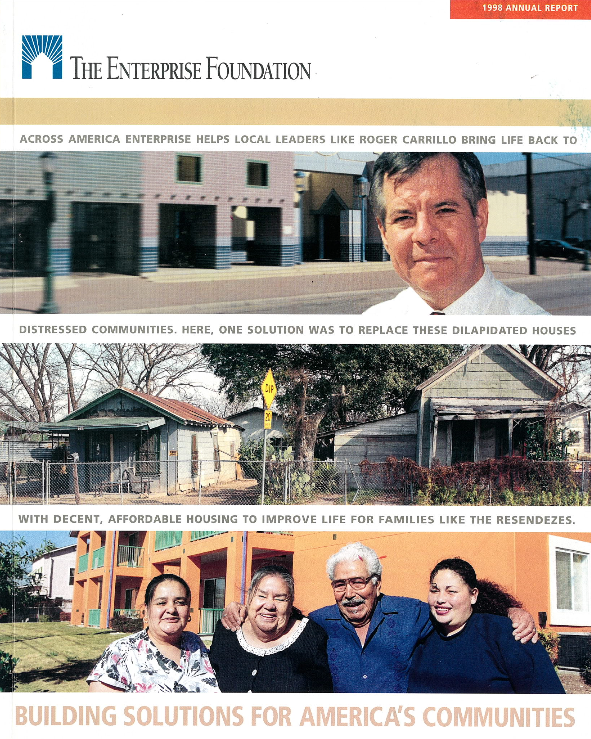 This initial project converged the political forces of neighborhood culture and commerce through a ground-breaking smart growth strategy, renovating Teatro Guadalupe for a coalition of Hispanic art groups in which an urban renew agency (San Antonio Development Agency) acquired the land, while a neighborhood association (Avenida Guadalupe Association) controlled planning and design. Quoted in a November 13, 1983 article in The San Antonio Light titled, “‘Prime time’ for West Side investment”, Avenida Guadalupe Association founding Executive Director is quoted, “It will be our task to show that the theater could realize a profit (for other commercial ventures)”. 1983, AGA completes the Avenida Guadalupe Market Analysis Development Plan considered to be the cornerstone plan document for the subsequent three decades of urban renewal strategies leading to the revitalization of the Avenida Guadalupe neighborhood. Analysis and plan were developed by Reyna/Caragonne Architects in association with Richard Tangum AIA, AICP for the Board of the Avenida Guadalupe Association with government assistance from the San Antonio Development Agency and the City of San Antonio Department of Planning. The document’s introduction states, “The Avenida Guadalupe Association, an active group of area businessmen and community leaders, was incorporated in December, 1979 to establish a plan for the revitalization of this neighborhood. For the past three years, the City of San Antonio assisted the Avenida Guadalupe Association in these efforts.” Further, the introduction notes, “The City of San Antonio has granted the Association $731,000 from Community Block Grant monies and the general fund to initiate the Plaza Project. 1983, President Ronald Reagan states, “You’ve embarked on extensive renovations projects, like Avenida Guadalupe. This will revitalize San Antonio while Still preserving its heritage”. 1984, Avenida Guadalupe Association realized the new-construction of Plaza Guadalupe as a renewed nucleus for Mexican-American politics, commerce and culture in San Antonio, Texas. Ultimately, Plaza Guadalupe represented a $740,000 investment that materialized as the first municipal (COSA) and community development corporation (AGA) partnership for the revitalization blighted Hispanic communities of poverty in San Antonio, Texas (then referred to as Urban Renewal). Channeled through the City of San Antonio, funding sources included Urban Development Action Grants (UDAG), Federal Job Act money, and Economic Development Agency funding. Rooted in Renaissance town planning, Plaza Guadalupe is a rare Post-Modern architectural statement. 1984 (1985), Construction of Davila Pharmacy, a 16,000-square foot medical center constructed to the west of Plaza Guadalupe along San Jacinto Street. Early Avenida Board Member Rudy Davila developed the pharmacy. Davila Pharmacy included doctor’s offices and parking facilities and was conceptualized as part of original community master plan efforts. Davila was a graduate of Lanier High School located 5 blocks north of the pharmacy. The architect was Ronald Bechtol. 1986, Architecture Magazine featured Plaza Guadalupe in an article by Mike Greenberg titled, “Colorful Symbols of Rebirth in San Antonio’s Barrio”, with opening statements from Avenida Guadalupe Association’s founding President Eugenio Macias. 1987, Adjacent “Our Lady of Guadalupe parish, the activist heart of this predominantly Mexican-American city (Los Angeles Times – 091317)”, Plaza Guadalupe hosts historic Papal visit (John Paul II). Quoting Father Rosendo Urrabazo, Times staff writer Marita Hernandez wrote, “A (papal) visit to the Hispanic community is a visit to poor people,” said Father Rosendo Urrabazo, president of the Mexican-American Cultural Center in San Antonio, the only institution in the country doing systematic research on Latino Catholics. “The Pope is not only visiting Hispanics, he is visiting the poorest people in the United States.” In a subsequent article (Los Angeles Times – 091487), Hernandez wrote, “While the Pope’s remarks were frequently greeted with polite applause, the loudest response followed the Pope’s final cheer of “Viva la Virgen de Guadalupe.” In the Chicago Tribune article (091387), “Hispanics Draw Papal Concern – Pope raises challenges on immigration”, writer Bruce Buursma notes that the Pope delivered his “speech in Spanish at the plaza of Our Lady of Guadalupe”. 1989, Construction of the Margarita Huantes Leadership and Learning Center on property secured by the Avenida Guadalupe Association as appropriated to the City of San Antonio as part of the first municipally owned adult literacy centers. The Margarita Huantes Center was ultimately sold to the San Antonio Independent School District in 2016 where adult education continues into the present. 1991, El Parian opened as a 18,000-square-foot multivendor marketplace at 1327 Guadalupe Street as a complement to Plaza Guadalupe and Teatro Guadalupe. Representing decades of planning by Avenida Guadalupe Association, it was intended to be the first for-profit venture of Avenida Guadalupe Association. El Parian Marketplace was to provide everyday products and services to the community-at-large. Support for construction of El Parian included a $165,000 grant from the Levi Strauss Foundation. The construction was financed with a $600,000 grant from the U.S. Department of Commerce, a $500,000 grant from the U.S. Department of Health and Human Services, a $372,000 grant from City of San Antonio CDBG funds and $65,425 in grants from the City of San Antonio general fund. Originally themed “Las Tiendas at Plaza Guadalupe”, El Parian now operates as an interior community mall and is a component of Avenida’s non-profit structure. El Parian’s ultimate construction cost was $1,215,425. Asset Preservation Emergency Repair Program – emergency rehabilitation projects assisting low-income seniors and disabled residents in our community. HUD Certified Counseling Agency – 11 years of homeownership training to over 1000 participants including one-on-one counseling sessions. Single Family Housing Program (In-Fill Housing) – Construction of seven homes with an additional 3-4 future homes as part of AGA-owned property development. 1996, On April 29, 1996 the Architects of record executed a Certificate of Substantial Completion to El Progreso Theater at 1306 Guadalupe Street. Avenida Guadalupe Association was awarded 15th, 16th and 17th year CDBG funds to acquire and renovate the 85 year old El Progreso Theater and to complete the project for purposes that benefit the Avenida Guadalupe target area and to generate program income to benefit Avenida. Considered the first “speaking” theater in San Antonio, Teatro Progreso opened in 1931, housed 550 seats, and “catered mainly to low-income families” as a “stomp and whistle theater” encouraging audience participation, especially when the projector or sound systems failed. Earliest advertisements refer to Teatro Progreso as “El Templo del Arte”. Programs featured fifth- or sixth-run American movies that thrilled the public for many years (before), but that attracted those on tight budgets with two-cent daytime show admission and midnight movies with door prizes, such as one of “15 goats and an elegant mattress.” Live shows at El Progreso included legendary singer Lydia Mendoza. According to author Rogelio Agrasanchez, Jr. (Mexican Movies in the United States), El Progreso was “usually parched on Sundays, when the entire family went to see the double-feature program and the occasional performances,”. Because of overcrowding, “A typical complaint concerned the noisy atmosphere during the shows… Having 400 to 500 people and lots of restive children in an enclosed space made it hard to keep it tidy all the time.” By the 1950’s, El Progreso dropped out of the San Antonio city directory. Paulo Garza operated El Progreso, as well as Teatro Obrero (interpreted as the O’Brian) on Houston Street (one of only two surviving Spanish speaking theaters at the time of the depression) and the Follies Theater which opened in 1948 on 800 block of South Pecos. Today El Progreso Theater serves the neighborhood as a space for: community assembly, municipal-projects organizing, decimating non-profit services to the poor, and as an event hall for weddings, quincineras, graduation parties, and conventions. 1996, The San Jacinto Senior Community Residence is Avenida’s first of three low-income senior residences. San Jacinto was built with major funding support from the State of Texas (TDHCA). Located at 1512 El Paso, San Jacinto’s fifty units offer elderly residents all the conveniences of modern apartments. A total project cost of $2,342,252 was recorded as contributed capital. Sources of funding for the construction of the San Jacinto included: $1,905,00 from a City of San Antonio HOME Program grant, $278,725 from a Texas Department of Housing and Community Affairs HOME Program grant, $95,527 in Federal Home Loan Bank Board Subsidies, and a John Heinz/SBC grant in the amount of $63,000. 1998, Creation of the 2020 Master Plan for the Avenida Guadalupe Association in partnership with the Division of Architecture and Urban Design of the University of Texas at San Antonio (UTSA). 2002, The Ernest C. Olivares Senior Community Residence is a seniors-only apartment complex located at 1003 Vera Cruz Street off South Brazos Street. This facility for independent senior living includes fifty-nine units with balconies and patios and several common areas and is a HUD 202 project designated for the creation of supportive housing for the Elderly. 2004, Las Oficinas de la Avenida Guadalupe was opened. AGA developed Las Oficinas, a 17,000-square-foot office facility located at 1313 Guadalupe Street, to provide the community more businesses, create more jobs, and offer additional opportunities and choices for residents of the neighborhood. 2005, Charles A. Gonzalez Senior Community Residence, Avenida’s third senior housing community is located at 2022 South Zarzamora Street and includes sixty (61) units with balconies, patios, and several common areas, all designed to facilitate independent senior living. Gonzalez is a HUD 202 project. 2006, Avenida entered into a revitalization contract with the City of San Antonio as an official Neighborhood Commercial Revitalization Project (NCRP) to perform commercial revitalization activities in the Avenida Guadalupe area. City records indicate that the amount of investment was $370,000 allocated from the Community Development Block Grant (CDBG) fund. 2007, Completion of the Guadalupe Westside Community Plan as a guide for action, innovation, and revitalization. The plan was developed with unprecedented participation from residents of the Guadalupe area over a period of 1.5 years in partnership with the City of San Antonio Planning and Community Development Department. Initiated and facilitated by the Avenida Guadalupe Association, the planning team consisted of twenty-seven members mobilizing two hundred and fifty community residents and stakeholders, and was achieved through the Community Building and Neighborhood Planning (CBNP) Program of the City of San Antonio. 2007, Completion of the Avenida Guadalupe Corridor Market Research Study prepared by Texas Group, Investment and Consulting Group. The purpose of the study was to measure the population growth/decline with the Avenida Guadalupe Corridor area as an important indicator of the desirability and prosperity to live and work in the Avenida Guadalupe Association target area. Among other data, the analysis indicated a $.6 million increase in property values cumulatively over a three-year period signaling AGA’s positive influence. Cinco de Mayo Observation (Annual) – In partnership with the Mexican Consulate, Avenida remembers Mexican General Ignacio Zaragoza Seguín (Goliad, Texas), best known for defeating invading French forces at the Battle of Puebla on May 5, 1862. 2009, Una Noche en La Gloria is established – San Antonio’s acclaimed Mexican-American Cultural Zone project is dedicated to economically developing capacity for self-sufficiency for creative entrepreneurs striving in the creative industries. “Una Noche” is a unique strategy of Avenida’s Neighborhood Commercial Revitalization project. 2013, AGA completed La Promesa Building, a Class-A office building constructed with support from the United States Economic Development Administration, the Office of Community Services, the City of San Antonio and vital gap funding from the Raza Development Fund (CDFI). A unique economic development strategy, La Promesa is a $3.4 million investment in the heart of the poorest community in San Antonio and is home to AARP and MCCI Medical Group. Architect for La Promesa was Lopez/Salas Architects with design participation from Gabriel Quintero Velasquez. Stainless steel art panels by Chicano Art pioneer Chista (Jesus Cantu) in collaboration with Velasquez were added to the east and west facades in 2015 as funded by Urban LIFT Fund support on behalf of Wells Fargo as administered by NeighborWorks America. 2015, Avenida Guadalupe Association formalizes its partnership with the Cesar Chavez March for Justice Legacy and Educational Foundation for management and mobilization of the San Antonio Cesar E. Chavez March for Justice, a 2.5 mile procession focused on observing the life and legacy of the Mexican-American civil rights leader and Navy veteran. The Chavez march assembles annually in the Avenida Guadalupe neighborhood project area for the past 20 years and proceeds to the Alamo at Alamo Plaza, its destination point. The Cesar Chavez March for Justice is co-sponsored by the City of San Antonio by special municipal ordinance. 2016, AARP Foundation Senior Community Service Employment Program (SCSEP) partner assisting low-income, unemployed individuals aged 55+ find work, and increase skills and build self-confidence, while earning a modest income. This partnership creates experienced employees that most often leads to permanent employment. SCSEP is administered by the U.S. Department of Labor.